Falls among residents of skilled nursing facilities are the leading cause of injury, hospital admissions and lawsuits for nursing home operators. The Centers For Disease Control & Prevention (CDC) reports that documented falls in LTC are 100-200 per year per 100 beds and average facility cost per fall may exceed $17,000. Note the CDC also states the average hospital cost for a fall injury is $35,000. 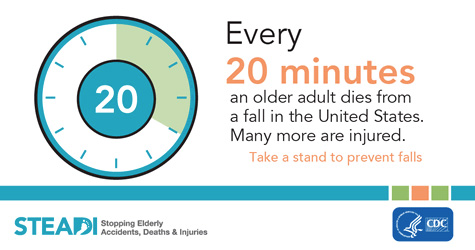 Falls rank as the leading cause of injury and death for seniors, according to this new data recently released by the Center for Disease Control and Prevention CDC). In 2014, a third of older adults reported falling at least once the previous year. Older adults suffered an estimated 29 million falls in 2014 alone, leading to seven million injuries and about $31 billion in Medicare costs. Falls are to blame for more than 27,000 senior deaths annually, according to the CDC. Officials urged healthcare providers to incorporate fall prevention activities into care routines. For over 25 years Personal Safety Corporation has provided the highest quality fall management products at the lowest factory direct prices to assist caregivers in reducing falls and injuries and nursing home operators in reducing the cost of managing falls and injuries.